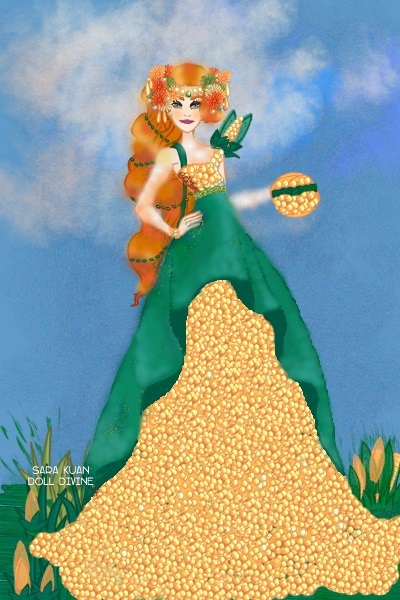 Fiona Vue: Week 11: The three Sisters- Corn! Semi_Final Round- the next round is the finals. Fiona and I hope you support us to get to the next round and cast your vote via crowns. Thank you to each and everyone who has supported us all along. We couldn't have gotten this far without you. Thank you all and best of luck to my fellow contestants. All Modern Fashion Dress Up Games! I can only imagine how long this took! Great work! Again-so impressed & so wowed!Very couture & simply stunning! This is amazing! I can't even imagine how long this had to take! I have to say that I would've had no idea what to make if I had to make something themed after corn, but you did a amazing job! The folds and her hair are just perfect! Another doll showing how talented you are at this! Since I've seen your theme I've think about a beads dress! Perfect! And I love the hairstyle! Woooooooooooow! This is simply mind-blowing! The dress is so gorgeous and original! A perfect design to represent the corn! I love the green overskirt and Fiona's hair! SIMPLY AMAZING!!! Gave lots of crowns to this unique beautiful dress! I love how you made the corn texture and of course the awesome leaf folds! Good Luck! This dress is so unique and a very quirky, I love it! I can tell you put a lot of effort into this dress and it really payed off. Her hair looks fantastic and the background is amazing. You really did an amazing job with this dress.